When most people think of places to visit in Arizona, the Grand Canyon is usually at the top of the list. And for good reason. The Grand Canyon is truly one of the 7 natural wonders of the world. It also used to identify Arizona. For the uninitiated, Arizona is labeled the “Grand Canyon State”. Now the surprise. There are dozens of other great places to visit in Arizona. Arizona was the western frontier of the United States from the mid 1800’s to the early 1900’s. The towns and landscape of Arizona were the back drop for numerous western movies and TV shows. From the early 1800’s to 1920’s Arizona was the wild west. Miners, gamblers, Indians and legends were found in Arizona. 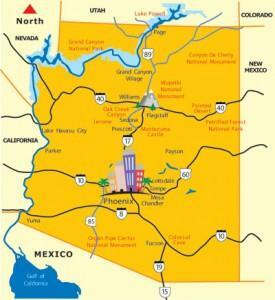 Arizona was the last to join the contiguous United States. It did so in 1912. It would take over 4.8 million pennies to equal the amount of copper used on the roof of the Arizona Capitol building. The Hopi village of Oraibi is the oldest Native American settlement in the United States. The village was built 1100 and was discovered in 1540. The largest observatory in the world is located at Kitt Peak, just south of Tucson AZ. South Mountain Preserve near Phoenix is the largest municipal park in the country. The Oldest Rodeo in the World is in Prescott, Arizona dating back to 1888. Habasupak Arizona is the only place in the U.S. Where mail is still delivered by mule. Havasupai happens to be located at the bottom of the Grand Canyon. The famous London Bridge is located in Lake Havasu City, Arizona. In Southern Arizona, Tucson provides a great “home base” for places to visit in Arizona. Tucson has a vast array of affordable hotels, motels and resorts and hotels. The City of Tucson is steeped in western history and makes an ideal location for day trips to even more interesting places. There are also a host of great things to do in Tucson Arizona every day depending on the season. Arizona has an vast array of interesting things to do, visit, see and remember. If you are considering moving to Tucson AZ or searching for a future place to retire to, we can help.